Plays his trumpet with complete awareness of the whole Jazz history while dealing, as a music director, with the full spectrum of sound sources in a broad range of innovative (and often strange) solutions, including frequent use of electronics. He has created his own music system, allowing him to take his open pieces to a high degree of perfection. 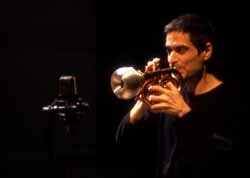 Director, arranger and trumpeter, Sei Miguel considers himself a simple jazzman, which, he says, isn't always easy. Born in 1961, Paris, lived in Brazil and France until settling down in Portugal during the 80's. Since 1986 he has been directing formations of variable geometry. Having performed in Portugal, Germany, Italy and Brazil, among his many regular collaborators are not only guitarists Rafael Toral and Manuel Mota, but also extraordinaire trombone player and painter Fala Mariam and virtuoso percussionist César Burago. Miguel has also written music for theater and ballet.